Taste test: There's not much to say about these — they are passable, but I wouldn't bother buying them again. 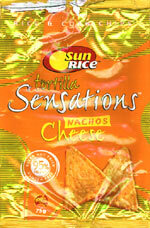 They are a corn and rice chip, which in theory works well, but in practice is fairly dull. 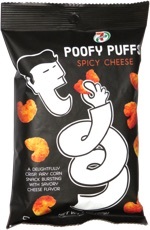 They are not saved by the boring cheese flavor. In all, they weren't great but where saved slightly with the introduction of dips. Smell test: A peculiar cheesy smell. This snack was discovered by Mairéad Doolan at Not Quite Right, Ashburton, Australia. Review published .